Gordon Shedden clinches second BTCC title in spectacular style. Scot forced to fight through from lowly grid slot to lift the laurels. Matt Neal plays vital role as Honda wins fifth manufacturers' crown. 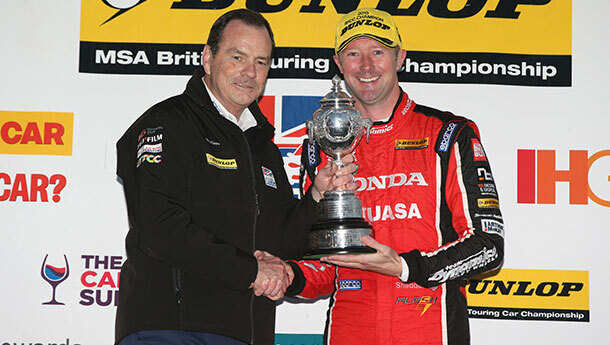 Gordon Shedden is the 2015 Dunlop MSA British Touring Car Champion, after a stunning drive on a dramatic final day of the campaign at Brands Hatch that also saw Honda crowned manufacturers' champions for the fifth time. Shedden arrived at Brands' legendary GP Circuit holding a 23-point lead in the drivers' standings, but as ever in the all-action BTCC, nothing can be taken for granted and so it was to prove. After qualifying a superb fourth on maximum ballast, Shedden played it safe in the opening encounter, sagely shadowing his chief title rival Jason Plato to the chequered flag in sixth - but contact from behind early in race two left the Scot with damaged suspension and he subsequently struggled to a 19th-place finish. Beginning the decider from the same lowly position - with Plato on the front row - Shedden had it all to do, and he responded magnificently. Following a brace of early safety car periods, the 2012 BTCC Champion scythed his way through to fourth - clinching the crown for a second time in spectacular fashion. After playing the dutiful rear-gunner role in race one, Neal stormed from 14th to seventh in the second contest and spent the majority of the finale embroiled in a frenetic scrap for the runner-up spoils - even going three-abreast at one stage. Ever the team player, the three-time BTCC Champion slowed to allow Shedden past on the penultimate lap, but fifth place was still sufficient to elevate him to third in the classification - the eighth time the 48-year-old has finished inside the overall top three as he marks his 25th season in the world's most fiercely-disputed tin-top series. "This means everything to me," confessed an emotional Shedden. "It's just incredible - I'm struggling to put it into words. It was teamwork at its best and this belongs to the team - you're only as good as the car you're sat in, and the Honda Yuasa Racing guys have given me an amazing bit of kit all season. The Honda Civic Type R only came out this year, and we've won both the drivers' and manufacturers' championships. "It seemed like the impossible dream going into race three, with Jason on the front row and me so far back. I could see the laps ticking down and I honestly thought I was going to run out of time and come so close yet so far. It just goes to show that you can't write the script in touring cars, because there are always so many twists and turns. I think it's going to take a few days to properly sink in..."
"What a day - it was fraught, busy and certainly tense, right down to the last lap of the last race," echoed Neal. "It was pretty nerve-wracking, which I suppose is par for the course in the BTCC! Race one was all about protecting 'Flash' - he had a power steering failure halfway through, so after that the focus was on getting him to the line. "The Honda Civic Type R then came alive on the soft tyres in race two, which enabled me to really fight through from a fair way down the order. That earned us the reverse grid pole for race three, which meant we had a chance to mix it up a bit. The car took a few thumps, but it stood up to the punishment really well. "'Flash' is on top of his game right now - absolutely the driver on-form - and he fully deserves his second title. Unity has been one of our key strengths at Honda Yuasa Racing - and what we've achieved here today is the reward, finishing first and third in the drivers' championship and securing the manufacturers' crown for Honda. What a way to end the season!